The concept is the “light weight”. It will give you the sporty look because of the carbon wrapped tip. The weight gets half of the stock muffler. We made each pipe and silencer lighter. The appearance is aggressive cannonball design and we wrapped it with carbon at the tail. 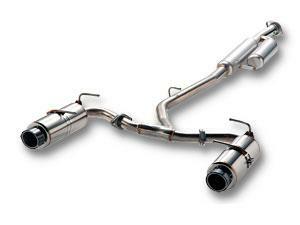 It is a pure sport muffler which has improvement in weight and output performance. Pipe plate is 0.8mm thick and silencer outer plate is only 0.5mm of SUS304 material(*). We designed super lightweight muffler. And still it has an efficient exhausting ability and cool sound. Only HKS can make this kind of high engineering exhausting parts. Usually super light muffler is made of titanium and they are very expensive. But HKS made super light muffler with stainless. Therefore HKS Hi-Power/Touring SPEC-L can be provided for a reasonable price. With HKS design efficient exhausting system and of course its lightweight will provide awesome performance of your vehicle.